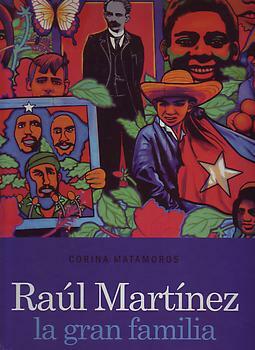 The structure of the book follows the pattern of the life experiences of painter, designer, photographer, muralist, and graphic artist Raul Martínez (b. Cuba 1927-1995) and how personal, political and aesthetic conditions defined his artistic production. Chief curator Corina Matamoros presents a comprehensive study where she establishes the connections of the constantly evolving artistic trajectory of Martinez, recalling through her personal observations the stages of doubts and ruptures his work underwent. A pioneer of the pop art movement in Cuba, as well as the political influences of Cuban Revolutionary art, Martinez' artistic trajectory spanned from Abstract Expressionism, to the later collages of historical and militaristic figures. Martinez' also had ties to the advertising agency OPTLA, and later to OSPAAAL (Organization in Solidarity with the People of Africa, Asia, and Latin America), and Casa de las Americas. "For the research done for this book, the author had exceptional access to the artist's personal archives, negatives and his personal collection. The wonderful collection of the Museo Nacional de Bellas Artes in Havana was the other main source of this study." --Verso cover.